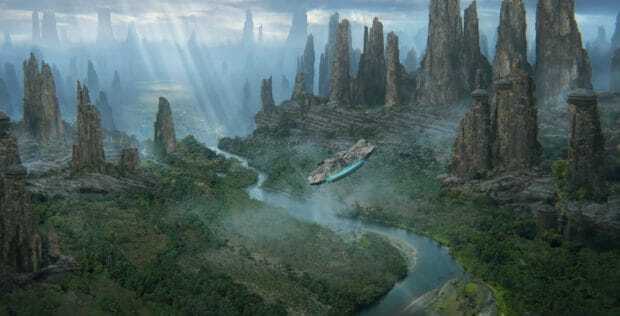 At last night’s Star Wars: Galactic Nights at Disney’s Hollywood Studios, guests who attended the Inside Galaxy’s Edge panel were able to hear exciting news about the upcoming new land. Story Editor Margaret Kerrison shared the name of the village in Galaxy’s Edge, which will be known as Black Spire Outpost. She also shared history behind the new name, and the village’s connection with the geological formations surrounding it. The Black Spire river valley, as depicted in an artist’s rendering. 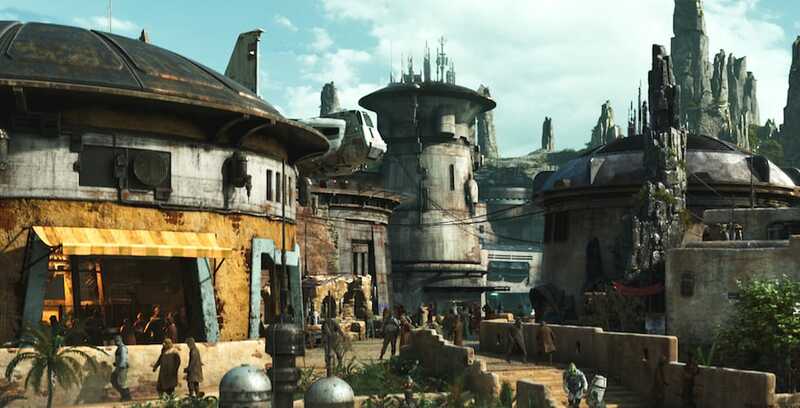 Black Spire Outpost is the largest settlement on the planet Batuu, and is an infamous stop for adventurers, traders and smugglers throughout the Outer Rim and Wild Space. Known for the petrified remains of the once towering ancient trees, the spires now stand guard across the plains and river valleys of Batuu. To the first settlers of this area, these petrified spires were more than just landmarks, but the heart of the outpost itself. Those Star Wars fans who saw “Solo: A Star Wars Story” on opening night this past Thursday were able to hear the name “Black Spire” for the first time, thanks to a passing line from the Lando’s droid companion, L3-37. Star Wars: Galaxy’s Edge will open in summer 2019 at Disneyland Resort, and late fall 2019 at Walt Disney World. Stay tuned to our website, Twitter, Facebook, and YouTube channel for more updates on Star Wars: Galaxy’s Edge.